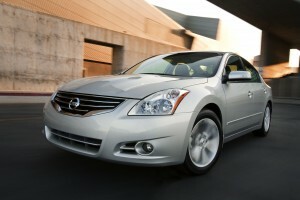 For 2011, Nissan’s Altima Sedan provides a unique combination of exhilarating driving pleasure, distinctive and sporty design and a wide range of available features and technology. Enhancements for the new model year include revised package content and three new exterior colors. The 2011 Altima continues to emphasize refined workmanship and the use of soft materials, such as padded armrests, and stylish chrome accents – with complementing fabrics and finishers for all interior colors (both cloth and leather-appointed). Altima’s instrument panel features a Fine Vision gauge display for precise readability and the L-shaped flow of the instrument panel to the center console adds to a driver-oriented cockpit feel. The “entertainment factor” of Altima’s interior is enhanced with an available Premium Audio Package that includes a Bose AM/FM audio system with nine speakers, 4.3-inch color display, USB port with iPod connectivity, Bluetooth Hands-free Phone System, MP3/WMA CD-ROM playback, XM Satellite Radio and RearView Monitor.